Here's the beautiful barred owl that Sarah photographed. "It was about 11 a.m. on a nice sunny day at a boat storage building in Tremont. The owl flew off the ground as we walked by and went to a tree branch 15 feet away and three feet off the ground. It turned and look at us for quite a while. It then flew back to the ground about six feet away from us, pecked once and scratched the ground twice with its back to us then flew back to the same spot. It wasn’t concerned with us at all. In fact I talked to it quite a bit and it seemed only bothered by the chance we may have caused it to lose a possible lunch. I went to work in the building and came out an hour later and it was in a different tree overlooking a grassy area in the woods. I yelled and it turned its head around then went back to its business. I’m kind of a bird nut and I’ve never heard one in the area let alone seen one and I’m at those buildings quite a bit. The pictures were actually taken by Sarah Brandon; she paints names and hails on boats for us." If you haven't heard one, the barred owl's call often sounds like the words "Who cooks for you?" The owl, however, appears to prefer its mice and squirrels raw. Put the festival on your calendar if you'll be in Maine then. As event organizer Michael Good of Down East Nature Tours says, "I had my first yellow-rumped warbler on the 8th of March so the birds and spring are coming!" Robert Krulwich of National Public Radio recently reported on a rare creature that was found living on Ball's Pyramid, an 1,844-foot jag of rock poking out of the Tasman Sea, off Australia. It was discovered (or, as we will learn, re-discovered) by a pair of rock-climbing scientists. They saw fresh, large insect droppings under a lone melaleuca (myrtle family) bush that was sticking improbably from a sheer cliff 225 feet above the shark-infested waters. But the climbers saw no insects. Only when one of the scientists and a local ranger scaled the cliff again, at night, by flashlight—yes, field biology can be a daredevil sport—did they find that same bush and the ground below it covered with hard-shelled critters almost five inches long. The creatures were Lord Howe stick insects, the heaviest flightless stick insects in the world. They are known as tree lobsters for their size and lobster-ish exoskeletons. Once prolific on nearby Lord Howe Island, they were thought to have gone extinct after a ship ran aground on Lord Howe in 1918 and brought in black rats, which ate every Lord Howe stick insect they could find. From 1920 until 2001, when the Australian scientists rock-climbed on Ball's Pyramid (following up on 40-year-old rumors that other climbers had found insect carcasses there), no one saw a single Lord Howe stick insect. As far as researchers can tell, the insects now live in the wild only on and under that one bush on that one spire of rock in the middle of the ocean. But the Melbourne Zoo has started breeding them in hopes of reintroducing them to Lord Howe Island. As Krulwich notes, this will require a major rat-eradication effort as well as a public-relations campaign to make the human inhabitants of Lord Howe Island more comfortable with an influx of fist-sized, hard-shell creepy-crawlies. The video above of a Lord Howe stick insect struggling to hatch (you may find yourself saying, "Come on! You can make it!") is part of the campaign to reposition the insects as courageous and lovable. Ball's Pyramid, where the climbers found the stick insects. One of the lessons of the Lord Howe stick insect is that some animals survive only in the most specialized of habitats. Another is that scientists often display an inspiring level of dedication in pursuit of knowledge. A third is that invasive species, especially on islands, can quickly wipe out other animals. But the lesson that, if you will, sticks with me is how strange we humans are in our relationship with other animals. We kill 'em off, bring 'em back, try to make them 'em sound so cuddly that Disney would turn them into cartoon characters. We're probably fortunate that our survival doesn't depend on whether another species thinks we're cute enough to keep alive. Have you looked up lately? Right now you have the chance to see at least two sights that you won't see this clearly for years to come. The two bright objects fairly high in the western sky, quite close to each other, in the four hours after sunset are Jupiter and Venus. Venus is the higher and brighter one. 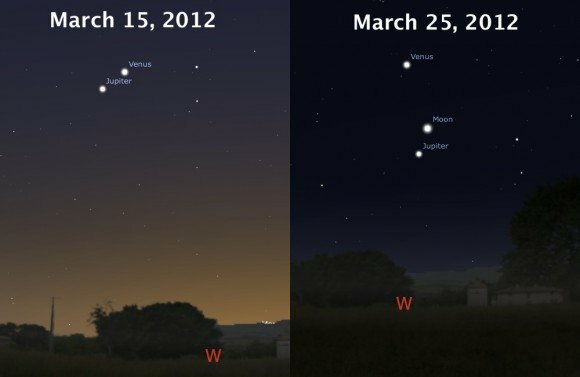 On the night of March 15 the two planets will be just 3 degrees apart. This moment of visual proximity is called the Venus-Jupiter Conjunction. When you go outside to look at Venus and Jupiter in the west, take time to look east as well. The red light you see will be Mars. It won't be this bright in our sky again until April 2014. You can see it from dusk to dawn. Einstein discovered that as we near the speed of light, time slows down. Anyone who has ever toiled in an office knows that the same thing happens during work hours on Mondays. So here's my idea. Instead of moving our clocks an hour ahead in the middle of a Saturday night to start Daylight Savings Time—a cruel mandate that costs us not just one hour of precious sleep, but one hour of precious sleep during the weekend—let's move the clocks ahead at 4 p.m. on a Monday, thus chopping an unwanted hour off the most hated work day, raising national morale, and giving us all a reason to think of Albert Einstein. We can brand the event as Relativity Monday. 1) One of the distinguishing traits of mammals is that they—and no other animals—have a middle ear containing three bones. That configuration has helped scientists trace mammals' evolution. For a fascinating account of how bones, fossils, DNA and other evidence have revealed the course of change and adaptation in animals (including us), read Your Inner Fish: A Journey Into the 3.5-Billion-Year History of the Human Body, by Neil Shubin, a paleontologist and evolutionary biologist at the University of Chicago. That mind-opening book, which among other honors won the Best Book award from the National Academy of Sciences and the Phi Beta Kappa Science Book Award, should be required frontier-of-knowledge reading for anyone who wants to understand how biologists, geneticists, paleontologists, anatomists and other experts have pieced together, with physical evidence, the connections between humans and all other life forms on Earth. The book also offers a fun look at how both detailed planning and extraordinarily good luck are sometimes required to find tiny, hundred-million-year-old bones buried in the surface of our vast planet. 2) The branches in the photo are turning red because spring sunlight is causing the plant to produce anthocyanin, an antioxidant that also gives grapes and berries their color. 1)Geologists use several criteria to distinguish minerals from rocks. Which of these is NOT true? a) Minerals are made of substances that were never alive. b) Minerals are never found above ground. c) Minerals have the same chemical makeup wherever they are found. d) The atoms of minerals are arranged in a regular pattern and form crystals. 2) Why is a barred owl called a barred owl?